"Mature rosette to 18cms. diameter x 18cms. high, but can bloom at smaller sizes. Silvery grey-green rosette with stiff, narrowly-tapering, recurved, deeply-channeled leaves. Arching or pendant spike to 12cms long, of carmine pink scape bracts with prominent trichomes on each bract apex and light purple petals. In the past 5-10 years this cultivar has been widely grown in horticulture but its exact origin and identity are unknown. The plant blooms and pups prolifically for some growers and there seems to be no variation--only the one clone (tissue-cultured?) in circulation ? 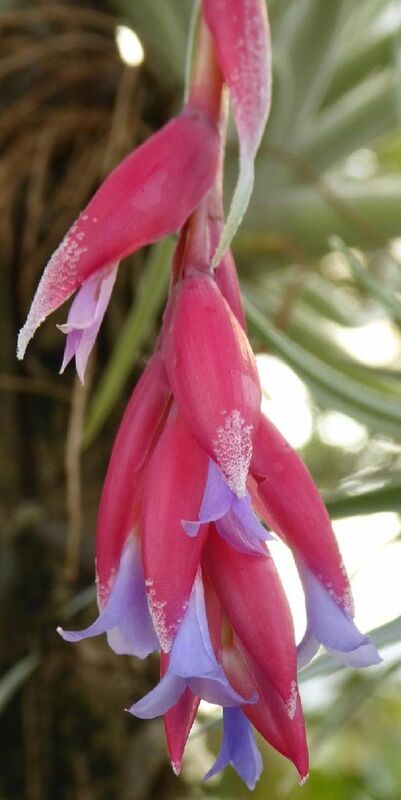 It has been sold commercially under a variety of different names, including "T. recurvifolia var. 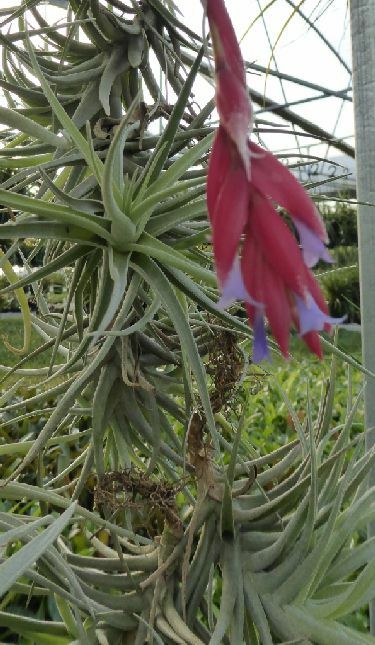 subsecundifolia hybrid". Netherlands botanist Eric Gouda has suggested it has links to T. leonamiana. Therefore Chris Larson of Melbourne, Victoria has registered it as T. 'Leon' until such time as its true identity is known. Reg. Doc. 10/2014 by C. Larson." Chris Larson 13/10/14 .... "Many of you got this plant from me under one name or other – with ??? after it – over the past year or so. I said I was going to register it as T. Leo – but that was already taken. So it is now T. Leon. Sorry for the confusion." Chris Larson 31/10/16 .... "This is a large form of the plant I have as T. Leon. 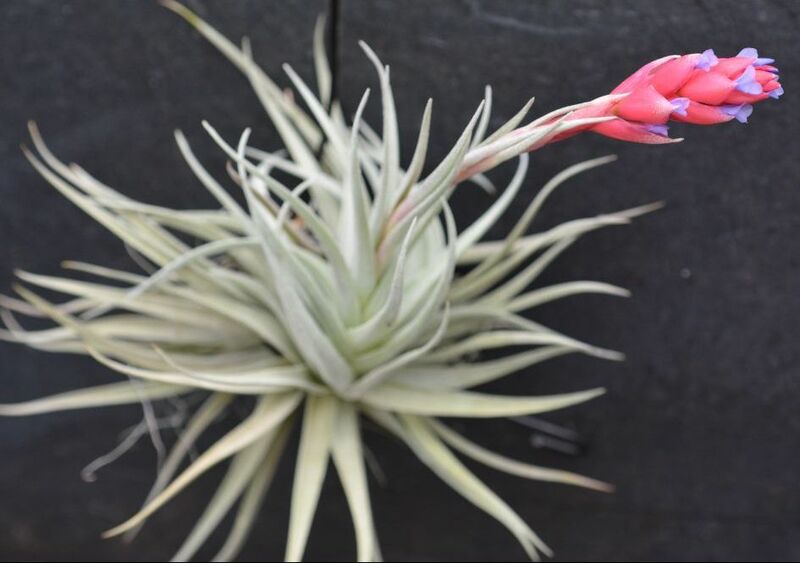 I found it in the trade under a name which was wrong by a long shot, and it will become a part of the commercial tillandsia trade in Australia – and will also be all over the world. Certainly it has links to the T. leonamiana complex – so we registered it as T. Leon. This particular plant grew much larger than the others, to about 8” across. Lately I have been noticing that under certain conditions plants will flower early and so the plants will be small. The same plants, when grown under different conditions, will not flower as regularly and grow to a much larger size. 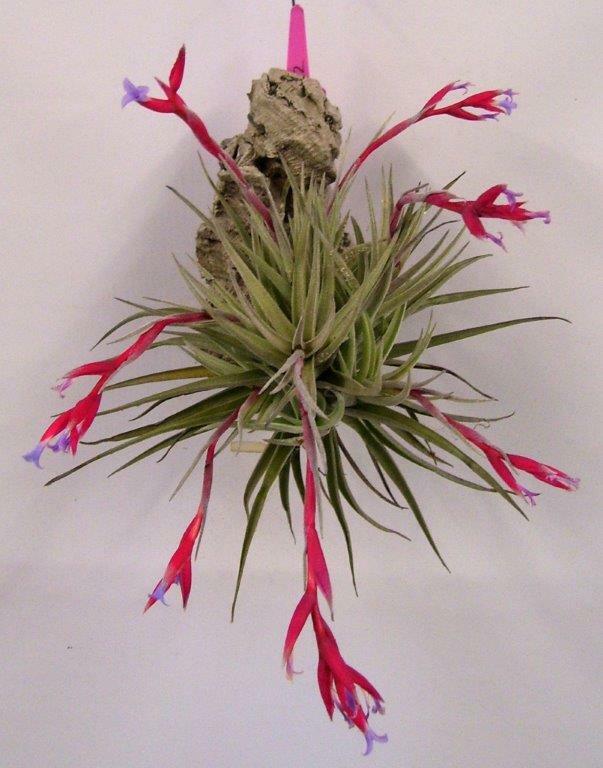 With regard to this, I have a friend up north (VB Bob) complain that the "elongated ionantha" that we grow flowers more regularly for him, and never reach the size we get."